NHIDCL Recruitment 2019 - Job notification for 28 DGM Posts in NHIDCL, Across India on Deputation Basis. 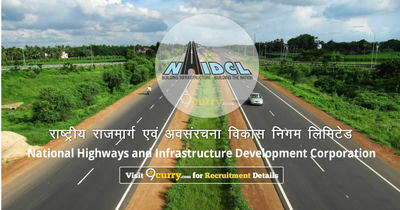 Applications are invited by National Highways & Infrastructure Development Corporation Limited on or before 15 Mar 2019 for 28 vacancies. Degree in Civil Engineering from a recognised University or Institute. (iii) Having 09 (Nine) years experience in an Organized service of the Government of India or equivalent level post or higher and well versed in the field of Roads/Highways/Bridge Engineering. (i) No Objection Certificate of parent Department/ Ministry for the appointment of the applicant to the post applied for. (ii) Vigilance Clearance, Integrity Certificate and details of penalties imposed, if any, during the last 10 years on the Officer. This should be duly certified by the Authorised Officer i.e. Head of Office /HoD. (iii) ACRs/APARs dossier/ Attested copies of the ACRs / APARs of the applicant for the last five years.